Last year my wardrobe resolutions were to challenge my comfort zone, accessorise more, and consider every purchase an investment. I feel confident saying I achieved those goals. I made more of an effort with styling fresh new outfits from pieces I already owned, and introduced a couple of new items - culottes and mules - which aren't styles I've previously worn. I planned out and deliberated (agonisingly so!) over every purchase I made, and ended up making very few overall. I've been pragmatic about the brands I work with and the items I allow into my wardrobe, and I gleefully let go of clothing that didn't serve me well with the help of seasonal purges. I definitely could work a little more on accessorising but overall I'm happy I stuck to last year's wardrobe resolutions. This year I want to focus on maintaining my all seasons wardrobe, working on any areas I’ve neglected, and doubling down on my rule of no unnecessary purchases. 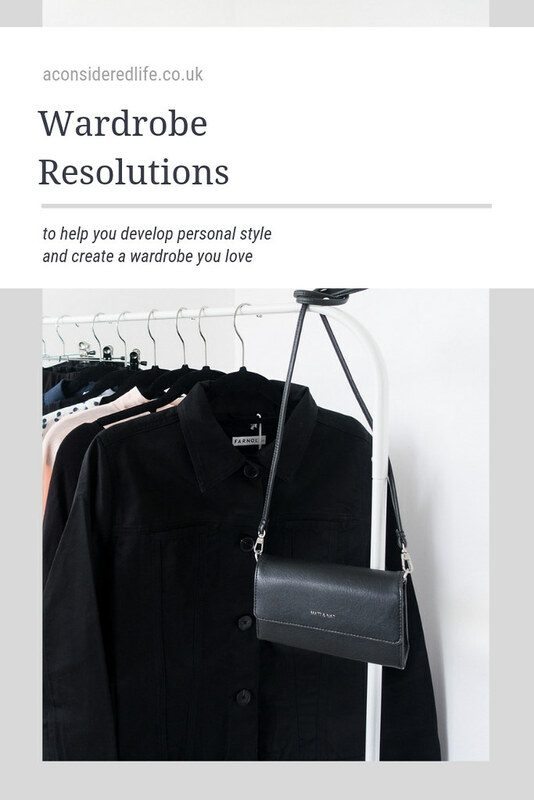 After five years of building a minimalist wardrobe, I’ve really hit my stride; I know exactly what works for me and what doesn’t, and how to maintain a curated collection of clothes that offer comfortable, effortless outfits with enough versatility I don’t get bored. These are my wardrobe resolutions for the new year. I’ve always been someone who wears what they want to wear, regardless of trends or the influence of others. However, I think we’ve all experienced doubts about our fashion choices and felt we need to experiment more so as not to become “boring". If you enjoy style, I think it’s important to test the boundaries of our comfort zone, if only gently, to keep that excitement alive. But it’s crucial to do it in a way that’s true to ourselves. On many occasions I’ve been teased about wearing all black all the time, and given encouraging compliments any time I’ve worn colour. It’s bothered me in the past but not so much anymore. I know what I like and I dress for myself. I want to continue to embrace what works in the new year to stay true to myself and my style. 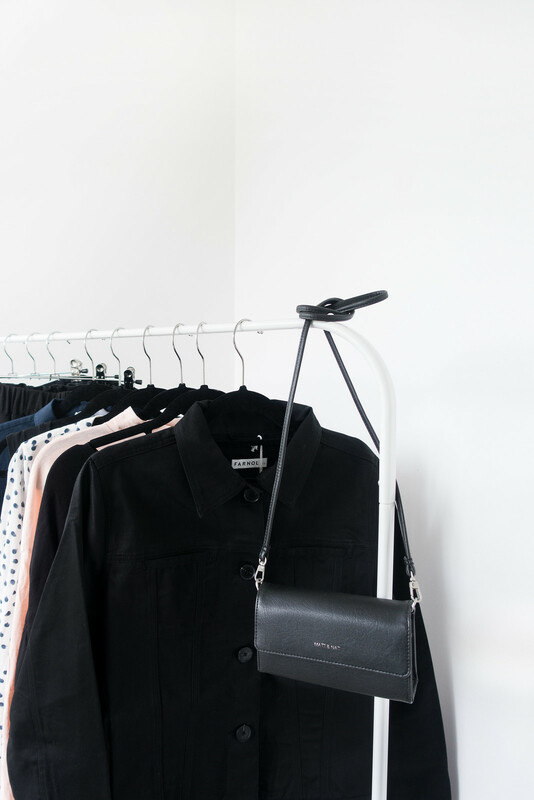 Although I'm reluctant to commit to any kind of spending ban; I have reached a point with my (anti) capsule wardrobe that I'm confident I could last a whole year without buying anything new. A bold statement, I know. I already have a one-in-one-out policy, which means whenever I put something new into my wardrobe I let something else go. I'm pretty good at only purchasing new items when something old needs replacing, or if I notice a gap in my wardrobe. I try my best to seek out second-hand clothes before opting for something new and if I notice clothing needs mending, I fix them up to lengthen their life. So far it's been working well; my wardrobe has hovered around 50 items for two years running. As part of my job, I'm fortunate that brands want to work with me and occasionally send me clothes. I have to be careful my wardrobe doesn't become bloated. I'm doubling down on making considered decisions about what items I accept, both ones I purchase myself and those I'm gifted. I've had a slight head-start on this one. I started piecing together a loungewear capsule a few weeks back when I realised I needed a couple more options for getting comfy at home. Loungewear is something I've neglected. I'm not keen on the usual options like pajamas and sweatpants but I do love a soft dressing gown, and my old one desperately needs replacing. I currently have a velvet maxi dress (purchased second-hand), which I like to throw a jumper over, and a couple of basic tees (demoted from my wardrobe) that I wear with leggings. These options work for me but I’d like to invest a little more effort into seeking out loungewear options. I don't count loungewear as part of my all seasons wardrobe but I don't want to buy anything new thing year; it might be tricky to build a loungewear capsule without making an purchases - let's see! Are you making any wardrobe resolutions?